From its name, you certainly know immediately that Inside Out Thought Bubbles APK 1.12.0 is an adaptation of Disney Pixar’s latest animated film. The movie itself tells about the feelings of a girl named Riley. It can make sad, happy, and so on. In this game, these feelings are joy, fear, anger, disgust and sadness. They will accompany you to solve various puzzles in headquarter. 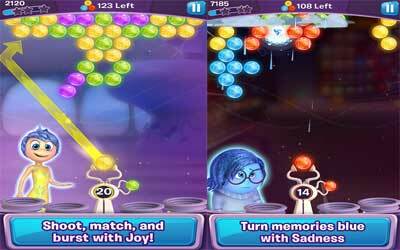 This is like the other gameplay of Bubble Witch Saga and Bubble Shooter game genres. The ultimate goal of this game is to drop all the colorful bubbles that exist by using the supplied bubble. The bubble provided is in limit. With specified time period, the colorful bubbles that exist can be a representation of the feelings. For instance, Joy is a representation of the gold bubble euphoria. Sadness comes in a blue bubble and so on. You only need to match at least three bubbles of the same color, so the bubbles you shoot can fall. You can simply point the shot direction by using your fingertips. Whether it is a straight shot trajectory direction or toward the wall, you can bounce with the help of the sight line like billiard game. There are several gameplay types in this game which are dropping every bubble that exists. You can fill the hole with bubbles targets but first, remove a barrier bubble around. Brain Freeze requires you to hit the bubble feeling that has been frozen until shattered. The last is rescuing the workers who trapped in bubbles. To save them, you need to destroy the bubbles around them. With more than 100 levels, this game provides the character’s voice of actors and actresses as the same as in the film version. It makes Inside Out Thought Bubbles for android to be more interesting to play. UNLEASH POWER-UPS – Create sunbursts with Joy, let the rain pour with Sadness, blaze a fiery path with Anger, repel matching memories with Disgust, and scatter orbs in frantic fun with Fear! OVERCOME obstacles like Brain Freezes and jump ahead using boosters like Brain Storms! CONNECT to Facebook to gift and receive free lives, and to see how you stack up against your friends! IMMERSE yourself in the world of the film through stunning 3D animation and gameplay featuring voice actors from the film! We can hardly contain our emotions with this newest update! Play to unlock bronze, silver, and gold chests filled with ever increasing rewards! NEW LEVELS ALWAYS IN STYLE! Be on trend this season and play new levels on Fashion Island!